2.1 Notices to competitors will be posted on the official notice board located on the exterior west side of the change room building. 3.1 Any changes to the sailing instructions will be posted before 17:00 on the day it will take effect. 4.1 Racing will take place every Thursday, starting May 09 and ending September 26, 2019. 4.2 The scheduled time for the warning signal for the first race of the evening will take place at 18:27. 4.3 When boats have finished they should proceed directly to the start area. The warning signal for each succeeding race will be made as soon as practicable after the last boat has finished the previous race. 5.2 Classes may be combined when numbers make it practicable. 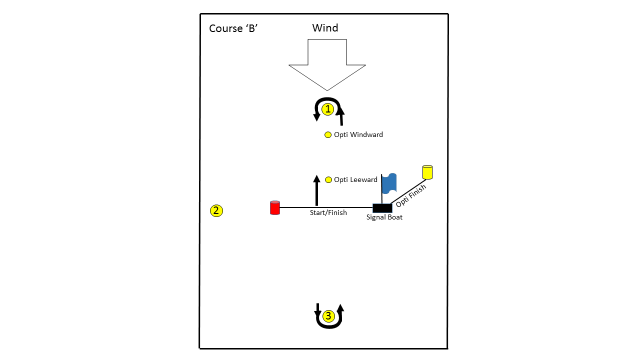 6.1 The course will be displayed on the Signal Boat before the first warning signal of each race. 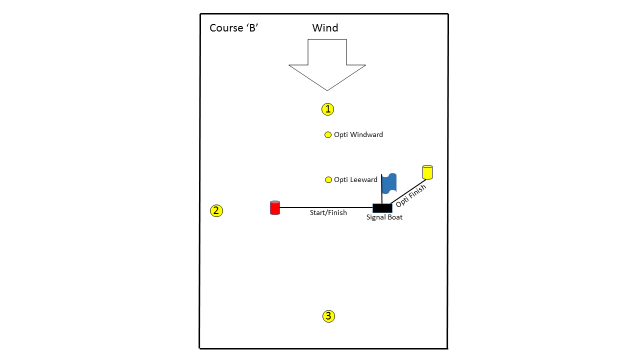 6.2 The “A” course will be a windward/leeward sausage with a finish line on the starboard side of the Signal Boat. 6.2.1 The “A” course may be modified by the addition of a triangle with the same finish line. 6.3 Course “B” will be either a sausage or triangle or combination sausage + triangle course with the start/finish line in the middle of the lake. 6.4 The course to be sailed will be displayed on the Signal Boat with either an “A” or “B” followed by sausage or triangle symbols, with each symbol representing once around the sausage or triangle in the order displayed. 6.5 When the course consists of more than one sausage, boats with a US Portsmouth handicap of greater than 100 will sail only one sausage. For scoring purposes their times will be doubled or tripled, depending on the number sailed by other boats. 7.1 Marks 1, 2 and 3 will be either yellow spar buoys or yellow spherical ‘exercise balls’. An exception to this would be when Optimists are racing, their windward and leeward marks would be smaller yellow marks (‘bouncy balls’), placed closer to the Signal Boat. 7.2 The starting mark will be the orange pin in the vicinity of the Signal Boat. 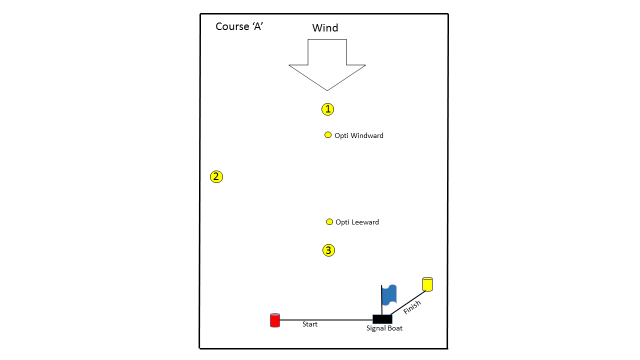 7.3 The finishing mark will be the yellow spar in the vicinity of the Signal Boat when the “A” course is sailed. 7.4 The finishing mark will be the orange pin in the vicinity of the Signal Boat when the “B” course is sailed (finish mark same as start mark). 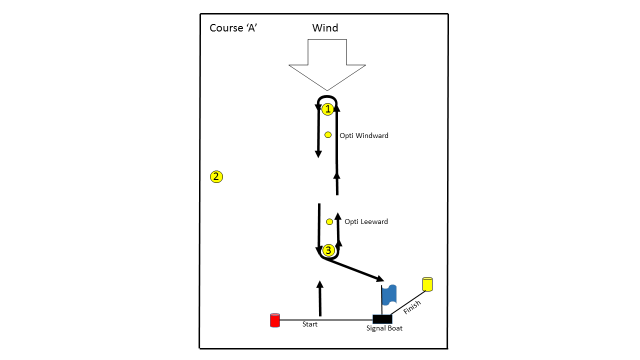 7.5 When the “B” course is sailed by the Opti’s their finish mark shall be a small yellow mark (‘bouncy ball’), set by the Opti coach off the starboard side of the Signal Boat. 7.6 The change of course mark as provided in SI 9 will be a spherical red mark (‘exercise ball’). 8.2 Green Fleet Sailors will start when the preparatory signal is removed (one minute prior to the regular start of their class). 8.3 The starting line will be between the orange flag on the Signal Boat and the starting mark (orange pin) at the port end of the starting line. 8.4 Boats whose warning signal has not been made shall keep clear of boats that are starting. 9.1 To change the next leg of the course, the race committee may choose to lay a new mark (or move the finishing line) or just move the original mark. If a new mark is placed on the course, the old mark will be removed as soon as practicable. 9.2 When, in a subsequent change a new mark is replaced, it will be replaced by an original mark. Any mark to be rounded after the new mark may be moved to maintain the course configuration without signaling. 10.1 The finish line will be between the yellow flag on the Signal Boat and the finish mark. 10.2 Boats failing to finish within 10 minutes after the first boat sails the course and finishes will be scored Did Not Finish (DNF) without a hearing. This changes RRS 35, A4 and A5. 11.1 Protests shall be delivered to the club office within the protest time limit. 11.2 The protest time limit is 30 minutes after the Signal Boat docks. 12.1 The SailWave CHIPS high points scoring system will be applied. This changes RRS 90.3. 12.2 The series will be split into five monthly segments: May, June, July, August, and September. The number of races counted for each competitor will be 80% of the total number of races run for each segment. 13.1 All competitors shall wear a Canadian approved PFD at all times while on the water. Competitors may temporarily remove their PFD only while adjusting clothing or personal equipment. Flag Y will not be flown. This changes the Preamble to Part 4 and RRS 40. 13.2 Competitors who require assistance should wave one arm with hand open. If no assistance is required, the arm should be displayed with fist closed. 13.3 A boat that retires from a race shall notify the race committee as soon as possible. 14.1 Competitors participate in the regatta entirely at their own risk. See RRS 4 Decision to Race. 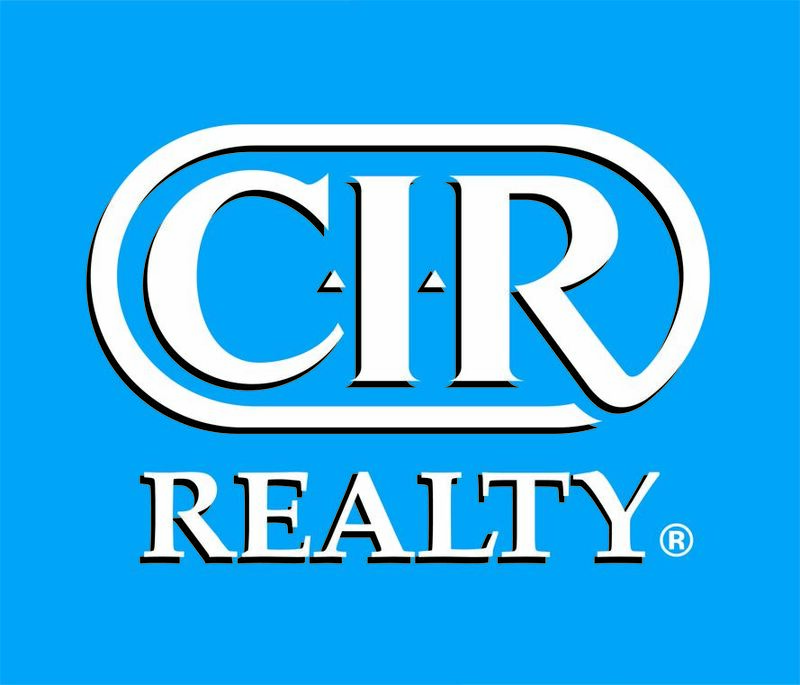 The organizing authority, its agents and the Calgary Yacht Club will not accept any liability for material damage or personal injury or death sustained in conjunction with or prior to, during or after the regatta. 15.1 Any boat which has current standing in any race of the latter 20% of a class may be coached at any time. All boats in the Optimist Fleet may be coached at any time.